The city announced that Delrish Moss was picked from a slate of three candidates. Moss has spent the past 32 years working for the Miami Police Department. Ferguson began its nationwide search for a police chief after Tom Jackson resigned last year. From our earlier story: Interim Chief Andre Anderson left the position in December. He had replaced Al Eickhoff, who took over after former chief Thomas Jackson resigned last year following a scathing U.S. Justice Department review of city's police and courts. Mark Becker - current East Chicago, Ind., police chief. Formerly he served as chief with the Portage, Ind., police. He spent 32 years with the FBI, before retiring in 2007. He has attended many management and leadership courses, including the Force Science Institute. Brenda Jones - Behaviorial Specialist for Macon Charter Academy in Georgia and former police chief in Pine Bluff, Ark. She has more than 28 years of law enforcement experience. She is an FBI National Academy Graduate and served in the U.S. Air Force for six years. 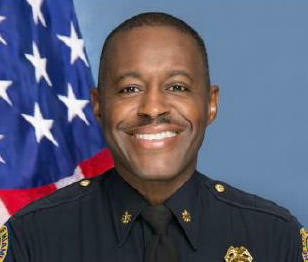 Frank McCall Jr. - current Berkeley police chief. He has participated in training and leadership programs run by the FBI, the U.S. Justice Department and the Missouri State Highway Patrol. He is also a member of the FBI National Academy Associates and National Organization of Black Law Enforcement Executives. Delrish Moss - supervisor of Miami Police Department's public information/community relations section and President of the Miami Police Athletic League. He is a member of the National Association of Black Journalists, the NAACP and Tender Essence Inc., which combats teen pregnancy, drug use and violence. The city said it received 54 applications from across the country; city manager De'Carlon Seewood, assistant manager Matt Unrein and human resources manager Patrick Young eventually narrowed the pool to six. Those candidates interviewed in Ferguson before panels of residents, city council members and law enforcement and criminal justice experts. The top four candidates have been interviewed by members and supervisors of the police department as well as residents. Seewood will then decide who moves onto a final phase and an extensive background check, before a selection is announced in April.